The gold rush is on! Private labelers are putting up product listings on Amazon in droves to cash in on their piece of this billion-dollar prize. Bundlers are developing packaged products and bringing in loads of sales. Manufacturers and wholesale sellers are adding their products to this vast marketplace in addition to selling on their own sites. Amazon is a moneymaking machine… and that’s the problem. With all this competition, can customers even FIND your listings on Amazon? The more people who find success selling on Amazon, the more crowded this marketplace becomes. That means shoppers have a huge number of options for the same product. That makes deciding which one to buy complicated. When customers have too many choices, confusion sets in and that’s never a good thing. make your products stand out in a seriously overcrowded virtual space where others might be selling the same things you are under a different brand name? improve your chances of showing up high in Amazon’s internal search engine and Google? play by Amazon’s rules (and very specific do’s & don’ts) and win? wimp out on the sales copywriting? Whether you’re selling an exclusive product you manufactured or you’ve private labeled a product that others are also selling on Amazon, you need listings that position yours as the obvious choice so you make more sales. I’ve weeded through the Seller Central help pages, had countless conversations with Seller Support and gotten priceless feedback from my Amazon clients that lets me know this method of Amazon copywriting makes a huge difference in their ability to rank higher and sell more. This is not rocket science. It’s not some over-inflated, off-in-left-field system that requires a MBA to understand. With my direction and a little practice, you’ll find it easy to create Amazon product descriptions that boost your visibility and earn you more money. It’s quick. It’s easy. It works! 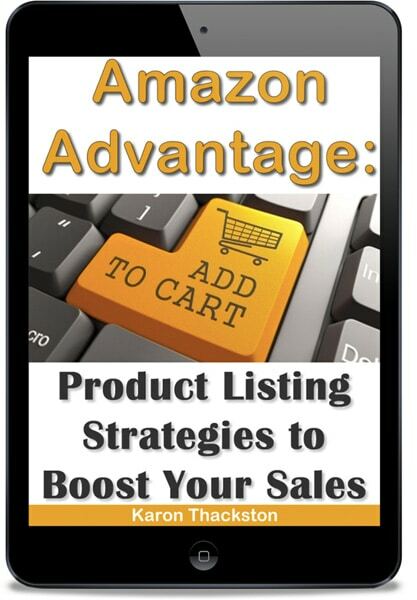 What’s included in the Amazon Advantage: Product Listing Strategies to Boost your Sales guide? jessica-profile-100px “As an Amazon FBA seller I am great at finding products, but writing the copy to “sell” them is a whole different story. I have been creating my own Amazon listings for 5 years now and honestly never put much thought into the descriptions or features list of the product page. My main concern has always been the keywords and the title. After reading Karon’s guide, I now understand the importance of these other areas and what a major impact they can have on product pages as well as some big things I was missing as far as the title and keywords went. judy-mick“I am so excited to have found Karon’s Amazon Advantage product description ebook. I’ve been selling on Amazon for a few years and eBay since 2007. To be honest, I never really spent too much time on the product descriptions – I was too worried about getting the correct keywords in my title to drive traffic. Now, I see that getting traffic to your page doesn’t mean anything if you don’t hold them once you’ve gotten them there. skip-mcgrath“I have been selling successfully on Amazon for the past eight years and have written several successful Amazon training courses, yet you can always learn new things. I’m an FBA seller on Amazon. Do I need this course? If you’re only selling products that are already on Amazon, you won’t need this information because you will most likely just tack onto an existing listing. Those who manufacture their own products, private label products or those who create bundles or new wholesale listings will find the strategies in Amazon Advantage: Product Listing Strategies to Boost your Sales extremely helpful! What if I’m private labeling the same product as lots of other sellers? Can Amazon Advantage: Product Listing Strategies to Boost your Sales help? Yes! You’ll discover how to set your product apart from the rest of the pack even if you are all selling the same thing. I’ve heard that developing a keyword list for Amazon products is vital, but I only seem to find a few keywords when I look. Will the Amazon Advantage: Product Listing Strategies to Boost your Sales guide show me how to find more? Yes! I’ll walk you through my step-by-step process and show you all the (free!) resources I use to find dozens of keywords that can drive traffic to your product listings. This e-course is about how to write exceptional titles, bullets and product descriptions so that your listing makes the most sales possible. It doesn’t go into the technical areas related to product listings. karon-giraffe-180px-2014I’ve owned and operated my own full-time copywriting agency, Marketing Words, since 1999. A large portion of the clients we’ve helped increase rankings & sales for are ecommerce sites. Now you can take my hands-on experience with turning so-so ecomm sites into profit-generating machines and apply it to your own site.